Want to make your bathroom really shine this holiday season? Give it a good deep clean! Who says deep cleaning only happens in the Spring? The family bathroom should get a good deep clean every few months in order to prevent water damage, mildew, and clutter. 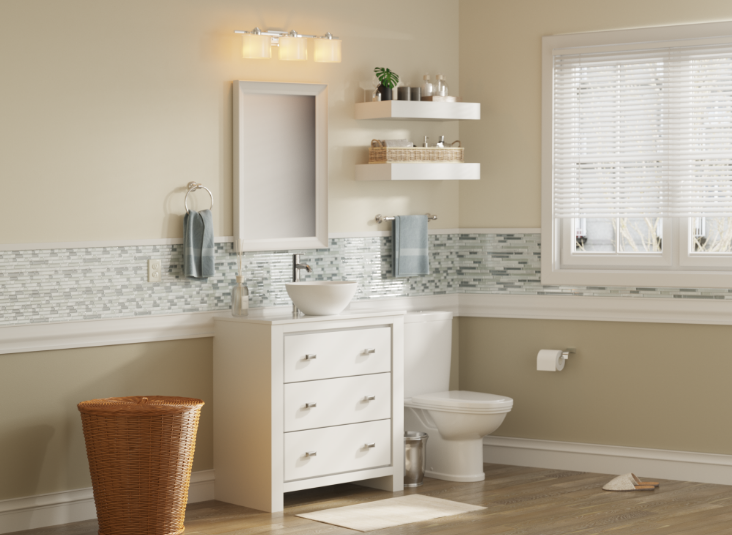 Here are 6 quick and easy steps to get that bathroom sparkling clean! Start by opening up the windows and turning on the lights. A well lit, well ventilated room is going to be so much easier and safer to clean. Before you begin, you will want to have handy everything you need; all-purpose cleaner, toilet bowl cleaner, rags, a scrubber brush, paper towels, the toilet brush, a broom and dustpan, and a mop. Sweep out the cobwebs from the upper corners of the room, and wipe down the blinds. All the dust will settle on the counter and the floor, but that’s okay, we’ll get to that in a minute. Next, empty out all of your drawers and cupboards onto the counter, being sure to toss out anything expired. Wipe out the inside of the drawers and cupboards with a mild detergent before putting everything back. Windows, mirrors, faucets, and countertops come next. Instead of wiping in a circular motion, wipe in a long sweeping zig zags from side to side and top down to prevent streaks and going over the same spot again with a dirty rag. A flannel cloth is best for leaving reflective surfaces lintless and streak-free. Shower and/or tub, sink, and toilet come next, in that order. First spray all three appliances down liberally with cleaner, and let it sit for at least 3 minutes before wiping down to allow the cleaner to thoroughly clean and sanitize. While you wait for cleaners to sit and do their thing, it’s a good time to do a quick floor sweep. After you empty your dustpan into it, take out the bathroom trash, making sure to rinse out and recycle any recyclable bottles. After making sure that the bottom of your tub and toilet are clean, it will be time to mop. A liberal amount of baking soda sprayed down and scrubbed with vinegar will whiten grungy grout right up. Remember, mop starting from the corner farthest from the door and mop your way out of the room so you don’t trap yourself into a wet, but dazzlingly clean, bathroom!